A longish run today across Turkey, made longer by a GPS assisted excursion down some minor roads. It is crucial when using a GPS to keep your brain enabled. If a sign says that a road is the way to the city you are aiming for, then it is probably the right road. The locals probably know the right way to go and Mr Garmin probably doesn't. Anyhow, it was all good fun (Stefan described it as Training...) and an intimate knowledge of the agricultural practices of central Anatolian subsistence farmers is bound to come in handy some day. 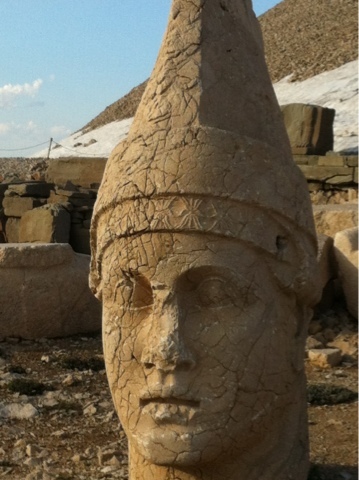 We finished up at a remote hotel on the slopes of Mount Nemrut, parked the bikes and trekked to the top. Antiochus was the local king in the last years BC. He built a rock platform at the top of the mountain (2100m high) and placed huge statues of himself, his wives and the gods facing the sunrise and sunset. If that wasn't enough, he then had a 50m high pyramid of broken stone built on top of the summit. It is thought his tomb lies within. Some cairn! As a request for future blog posts I have a couple of questions that I think would give some fun answers. 1. What piece of kit do you think you could have done without each week (maybe it breaking, not being needed or simply being a faff). 2. What piece of kit do you think you could have really needed, real or fictional (self-washing visor, Touratech dog-plough). Could you also tell us a little bit about your other travellers as your post about the trials of the Van Man was nice to read.